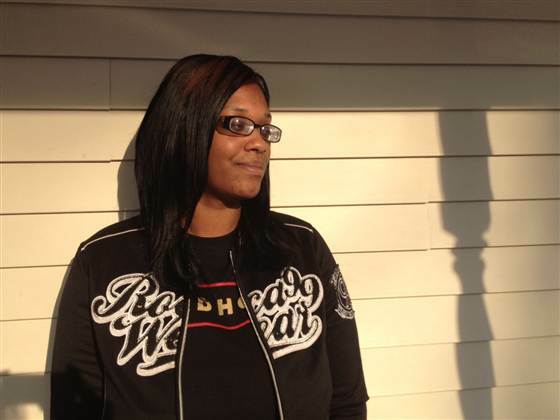 Tamesha Means, 30, of Muskegon, Michigan, claims in a lawsuit that she received negligent treatment from a Catholic-run hospital that abided by religious directives instead of appropriate medical care when she miscarried in 2010. A Michigan woman who suffered a dangerous, painful and prolonged miscarriage when she was 18 weeks pregnant is at the center of a lawsuit that claims she was denied appropriate treatment by a Catholic hospital guided by religious, not medical, concerns. The American Civil Liberties Union and the ACLU of Michigan are suing the United States Conference of Catholic Bishops on behalf of Tamesha Means, 30, of Muskegon, Michigan, according to a lawsuit filed Friday in U.S. district court in eastern Michigan. The suit comes amid growing numbers of mergers between Catholic hospitals and non-religious systems in the U.S. and it argues that the Bishops’ directives — particularly those that ban abortion — result in negligent treatment for certain patients. “They have an obligation to ensure that the directives do not increase harm to women’s health and that women have the information they need,” said Louise Melling, an ACLU spokeswoman. The lawsuit claims that Means, then the 27 year old mother of two children, received negligent care at Mercy Health Partners hospital in Muskegon after her water broke in December, 2010. She visited Mercy Health Partners, the only hospital in her county, three times. Means says she was given medication and told to go home and wait for the pain to get better. On a third trip, as the hospital again prepared to send her home, she miscarried and the fetus was delivered feet-first in a painful and prolonged breech delivery, the lawsuit says. Because of the Catholic-run hospital’s medical directives, which prohibit abortion, Means was not told that the child had, “virtually no chance of surviving,” and that continuing the pregnancy would endanger her health. A spokesman for the U.S. Conference of Catholic Bishops said the organization would not comment on the lawsuit. Mercy Health officials did not respond immediately to an NBC News request for comment. Catholic systems run 630 of the nearly 5,000 community hospitals in the U.S., according to the Catholic Health Association of the United States. They’re governed by religious directives, which generally prohibit abortion and also forbid sterilization procedures such as tubal ligations or vasectomies. Those rules can cause conflict in certain situations where medical need may be at odds with the directives, research shows. More than half — 52 percent — of obstetrician-gynecologists working in Catholic hospitals have faced such conflicts with religious policies, according to a 2012 study in the American Journal of Obstetrics and Gynecology. One doctor encountered a conflict with a hospital ethics committee when he wanted to terminate the pregnancy of a woman with aggressive cancer who needed chemotherapy, according to a report in the American Journal of Bioethics Primary Research led by Lori Freedman, an assistant professor at the University of California, San Francisco. Mercy Health Partners is overseen by parent company, Trinity Health, which merged in May with Catholic Health East, a health system that includes 82 hospitals in 21 states. It’s the second-largest non-profit health system in the U.S., according to Moody’s Investors Service. The lawsuit alleges that Means' case was among five instances in which Mercy Health Partners had not induced labor in pregnant women whose water broke before their fetuses could survive. Joseph O’Meara, the hospital’s vice president of mission services, said that the directives authorized by the Catholic bishops prohibited the hospital from inducing labor. The suit seeks damages to be awarded at a jury trial. Religious directives be damned!! What happened to there being doctors and WTF happened to the hippocratic oath?!??! Beyond new state efforts to restrict women’s access to proper reproductive health care, another, if quieter, threat is posed by mergers between secular hospitals and Catholic hospitals operating under religious directives from the nation’s Roman Catholic bishops. These directives, which oppose abortions, inevitably collide with a hospital’s duty to provide care to pregnant women in medical distress. This tension lies at the heart of a federal lawsuit filed last week by the American Civil Liberties Union. The suit was brought on behalf of a Michigan woman, Tamesha Means, who says she was subjected to substandard care at a Catholic hospital — the only hospital in her county — after her water broke at 18 weeks of pregnancy. Doctors in such circumstances typically induce labor or surgically remove the fetus to reduce the woman’s chances of infection. But according to the complaint, doctors acting in accordance with the bishops’ directives did not inform Ms. Means that her fetus had virtually no chance of surviving or that terminating her pregnancy was the safest treatment option. Despite acute pain and bleeding, Ms. Means was sent home twice, and when she returned a third time with a fever from her untreated infection, she miscarried even as the paperwork was being prepared to discharge her again. The fetus died soon after. How the suit will play out is unclear, but it showcases an important issue. Catholic hospitals account for about 15 percent of the nation’s hospital beds and, in many communities, are the only hospital facilities available. Allowing religious doctrine to prevail over the need for competent emergency care and a woman’s right to complete and accurate information about her condition and treatment choices violates medical ethics and existing law. The problem Ms. Means encountered is not unique or limited to her particular medical needs. In 2010, the Diocese of Phoenix punished a nun and stripped a hospital of its affiliation after doctors there performed an abortion to save a mother’s life. In a statement last Friday, the president of the bishops’ group, Archbishop Joseph Kurtz, said that the religious directives did not encourage or require substandard medical treatment. He also portrayed the case as an attack on religious freedom — the same unpersuasive argument the bishops are making against the new federal health care law’s requirement that all plans include contraception coverage. The bishops are free to worship as they choose and advocate for their beliefs. But those beliefs should not shield the bishops from legal accountability when church-affiliated hospitals following their rules cause patients harm.